January | 2014 | Htbaa blogs? Earlier today I found a link to a Gamespot video about why you should buy a Wii U in 2014 and I couldn’t agree with it more. So why should you get a Wii U in 2014 (if you haven’t already bought one). For starters, Nintendo games are great. The current Wii U line up is much better than the PS4 and Xbox One line up and that will stay that way for at least a year to come, which isn’t surprising as those have just been released. But in all honesty the upcoming PS4 and Xbox One games aren’t really that interesting yet (aside from The Order 1886 for PS4, but it doesn’t have a release date yet). Secondly, it’s a LOT OF FUN to play games on the Wii U. The Gamepad with touchscreen works really nice and if you really want to most game support the Pro Controller as well, which resembles the Xbox 360 controller. And if you own a Wii you can also use your WiiMote controllers. Thirdly, all Wii games can be played on the Wii U. All you need is a Wii game, WiiMote and the sensor bar (not included in the Basic pack). If like me you’ve skipped the Wii then there’s lots of great Wii games you can now play as well. Up scaled to 1080p on your HD TV. Fourthly, there are plenty of games that support off-tv gaming. Someone wants to use the television to watch something? No problem, just switch to the Gamepad display. Fifthly, Miiverse is a lot of fun as well and is supported for every game, even Virtual Console titles. And then there are the cross platform games that are better on Wii U such as Rayman Legends and Splinter Cell: Blacklist. There’s even Call of Duty: Ghosts. Granted, 3rd party support could be better and hopefully 3rd party game coverage will increase. Luckily there are also numerous cross platform games in the eShop available such as The Cave and Castlestorm. The upcoming Wii U games are very promising as well such as Mario Kart 8, Super Smash Brothers, Bayonetta 2, Donkey Kony Country Tropical Freeze, X, Project CARS and Hyrule Warriors. Now watch the video, then order a Wii U. Nintendo can use some love. 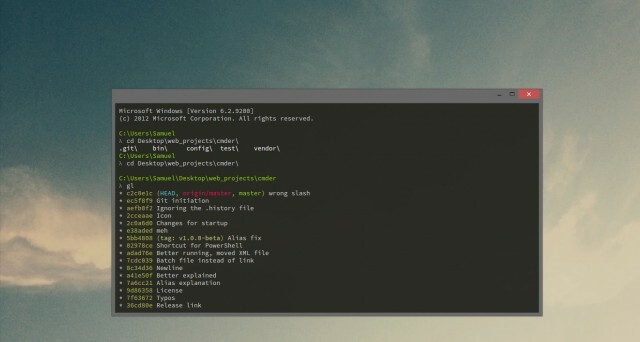 Looks like there’s finally a decent replacement for the Windows command line tool! It’s called cmder and comes with Git (optionally) and a bunch of other great command line utilities such as curl, cat, ls, less and even ssh! I did run into a couple of issues with the console not responding and also couldn’t use tmux during an ssh session. But that’s fine for now, I’m willing to give it a chance. You can get it at http://bliker.github.io/cmder/. I had planned on setting up a private Wiki to use as a personal clipboard collection of useful snippets for some time now but never got around to it. This week I decided it was time to get it done and so I started searching for Wiki software. I ended up trying MediaWiki but ran into installation issues due to PHP’s session.save_handler not being set. After changing it I ran into more issues and with MediaWiki unable to store session data I couldn’t proceed. I’m not sure why MediaWiki requires this setting though as I run several WordPress websites and some other PHP code as well and they’re not having this issue. Moving on I found out about DokuWiki which is really easy to install! Simply download the package, extract it and you’re done! It doesn’t require special database software such as MySQL – it stores pages on disk. Zero hassle and easy to use as well! At the beginning of the year I had decided not to buy any new games because my backlog was too big – how I manage my backlog will be covered in another post. But hey, who can resist a good bargain? In March I bought a used PlayStation Vita. I bought it because it was really cheap and since I already have PS Plus for PlayStation 3 it would mean ‘free’ games every month. The moment Sony started with PS Plus for PS Vita I have added the games to my list so I already had quite a few games for that device. For the Vita the year wasn’t too bad when it comes to buying games. So far I’ve only bought ModNation Racers: Road Trip and Killzone: Mercenary. The rest of my PS Vita games come from PS Plus. But a few months later I bought a Wii U for a really nice price at that time. I really like the console and think Nintendo should receive a lot more credit for it and for the games as well. So with the Wii U as a new console some more games started coming in. Somewhere starting September till the end of the year games are put on offer a lot and for ridiculous low pricing sometimes as well. And thus the power to resist gets to an all time low level. I’ve mostly focused on getting some Wii U games, only bought 4 PlayStation 3 games (which 3 of I’ve yet to play) and a number of Xbox 360 games. Then come the bundles for PC. You know, those where you pay a few bucks and get like 6 games. I mostly buy these only because there are one or two games I’d like, but it does add to the backlog. Oh yeah, I also bought a Nintendo 3DS XL for a really low price. And what’s a console without games? Boring, so I got 2 games for that as well. During 2013 I made use of a GoalTracker app that would let me track positive and negative goals. Positive goals are things like going to the gym, negative for me would be buying a game. Because that app has a bug which causes it to stay stuck in the year I started it I no longer keep track of these things (I do for some, but with another app). Total amount of new games in 2013: about 41. And that doesn’t even include those gotten for ‘free’ through PlayStation Plus and Xbox version Games With Gold. My backlog currently consists of 135 games I’ve got yet to play. I’m busy playing about 22 different games – not at the same time, they’re in Doing list for as long as I’m interested in finishing them. And my wishlist has about 93 games on it… I blame the length of these lists on PlayStation Plus, Xbox’s Games With Gold and the Steam Summer Sale in 2012. And my own weakness of course :-). For 2014 I plan on not buying a game for a console unless I’m all done with the games I’ve got for it. I will make a couple of exceptions though! A game like Final Fantasy X/X-2 HD Remaster and Final Fantasy XIII-3: Lightning Returns will be bought regardless of how many games I’ve got left to play. But that’s about it. I swear! The positive part about all this is that I did actually finish quite a bunch of games in 2013. I just bought more than I could handle :-P. But this year will be different, just like 2013 was supposed to be!